Since I started writing this blog last year I’ve had no less than four women that I’ve interviewed or spoken with who have mentioned St Kilda Cycling Club (SKCC) as the club to join in Melbourne if you’re a women. So I thought I should find out a little more for myself by speaking to one of the key people behind SKCC women’s program, Gaelene Snelling. When I spoke to Gaelene a couple of weeks ago she proudly reported that of the current 600 SKCC members, 165 of these are women who are signed up on a mixture of racing and recreational licences. That’s an impressive 27.5 per cent of the total membership which I’m sure is a great deal more than most cycling clubs in Australia. So I asked Gaelene what her club’s secret was, and it was no surprise that she said there wasn’t really a secret. She, along with many others has worked hard to encourage women to join the club by building activities gradually. Gaelene describes it as four fundamental things. The first is to have a mission statement that guides the whole thing. It reads – “To encourage, support and provide opportunities for women of all ages & abilities to reach their cycling goals”. Women know what women want! Having a degree of financial independence (they did some separate fundraising to ensure this). The first step the club took was to introduce a women’s ride back in 2005 and it was for this reason that Gaelene actually joined the club. Fast forward to 2008 and they formed a women’s sub-committee and though the committee they planned constant initiatives to encourage women including women’s only grades in racing, additional women-only rides, a sponsored women’s race team and a women’s development program. The thing that most appeals to me is that they set out to encourage women of all ages and abilities and from what I’ve learnt they have certainly succeeded. They have elite women racers right down to weekend recreational riders and every thing in between. To me that really sums up what women’s involvement in cycling should be. Gaelene is also big on communication and has a weekly e-newsletter updating members about women’s activities in the club plus she personally calls all new female members to welcome them. Last year they entered and won a National Bicycling Achievement Award (Organisation) for the club’s commitment to increasing women’s participation in cycling. I would certainly be lining up to join SKCC if I lived in Melbourne. But instead of relocating I’m keen to work with other members of my own club LACC to encourage more women to take up cycling and join the club. Stay tuned on that one. I think SKCC do a great job. But I do think it’s a pity that there’s a belief out there that if you’re a female in Melbourne then you have to join SKCC. There are plenty of clubs out there and each club has their own personality and each serves it’s members differently. St Kilda has positioned and marketed themselves very well and have definitely done a lot for female cyclists, but there are other clubs. 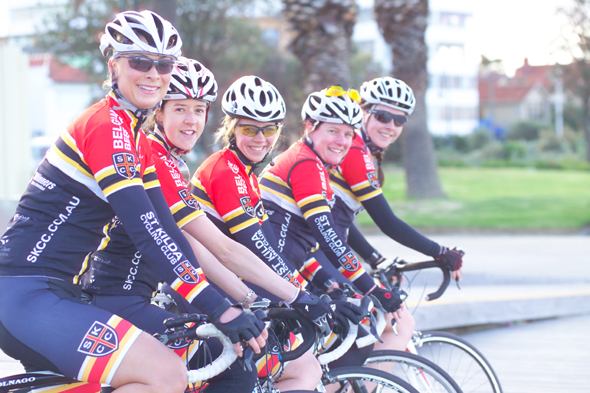 It’s a pity some clubs are experiencing an exodus of female cyclists to SKCC. People are joining SKCC because it is a warm, friendly and inclusive club that loves, embraces and encourages its female membership. How many other clubs put on 3 grades of Women’s racing every Sunday in summer? is disappointing because I would say the point is more it’s a pity more clubs aren’t embracing female cyclists and SKCC’s welcoming style in general. Maybe if they cares about thier female members thier would be no exodus. Why don’t you join SKCC yourself and see why its the number one destination for female cyclists? Hollywood – I totally agree with your comments. It’s not a pity, it’s fantastic that such a club has a great female program and that it creates good competition within the grades. How many other clubs have a 15+ strong C grade womens race each week? It’s not a competition about which club is better, its about where female cyclists can be embraced, offered great support/coaching and great racing! Because I love my current club, it rocks! The club is a little too fashion conscious, focused on looking good, wearing the right gear, and if you’re not elite bub bye. Nemesis – that is a bit superficial. There is a lot of focus around wearing the club kit to participate in the club rides. There is definately more stuff than just for just elite riders. Inverloch/Bright training camps, daily women’s rides, pro-lead training sessions, monthly meanders and lets not forget about the coffee with velo vendre! That is just to name a few off the top of my head. Zena – I’m seeing a change in other clubs, having them respond to the “exodus” to have women’s rides, mentoring and skills sessions, forming a sense of community and identity within their own clubs to retain and encourage their own memebership to participate and compete. Hawthorn, Brunswick and Coburg have made an impact in this. Interesting I would have thought that a large club like Carnegie Caulfield would have more of a presence and be advertising and rasing the focus of women’s cycling.